Ottawa – July 11, 2018 - A new survey reveals that women’s shelters across Canada often struggle to accommodate women and children because of lack of capacity. The survey, Shelter Voices 2018, was produced by Women’s Shelters Canada – a national organization representing shelters and transition houses for women and their children fleeing violence. 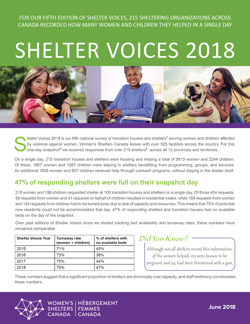 The survey’s results come from a one-day snapshot at 215 shelters across the country, which on that day were housing 5,857 women and children. But 47% of the shelters were at full capacity, so only 100 of 404 women and children newly seeking shelter that day could be accommodated – a 75% turn away rate that has unfortunately been typical over the last five years because of underfunding. And while women with disabilities face the highest risk of partner abuse, underfunding means that 25% of the shelters currently can’t afford accessibility renovations. The survey was released at the first-ever Women’s Shelters Canada national conference, where UFCW Canada activists were proud to join the advocacy to increase shelter services including the formation of a National Action Plan to End Violence Against Women. You can download the Shelter Voices 2018 here. To find out more about UFCW Canada’s work to end gender-based violence, visit www.ufcw.ca/women. To join the #NoMore campaign to end Gender Based Violence and to participate in a brief anonymous survey on violence and the workplace, click here.